Pope John Paul II‘s early life experiences with communism made him a great opponent to the doctrine that had ruined his home country of Poland. These battles with communism left John Paul deeply suspicious of Marxist thought. That included liberation theology, a Soviet tool which tried to bring the concern of Jesus for the poor to bear on the miserable living conditions in Latin America. For John Paul, liberation theologians had borrowed too much from Marxism. The most famous images of his concern occurred during a visit to Nicaragua, where priests were serving in the cabinet of the Sandinista government. John Paul wanted them out. One of them, Ernesto Cardenal, met him at the airport, and the pope visibly admonished him. 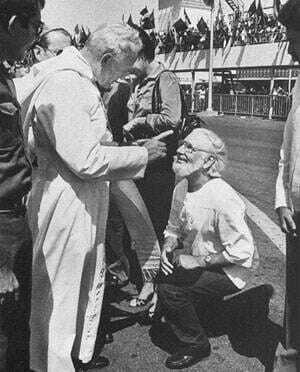 Pope John Paul II scolds Marxist priest Ernesto Cardenal in 1983. And Pope Francis is no John Paul II. Francis is embracing Marxists and celebrating Jew-haters. Instapundit posted this very concerning list of recent papal actions. VATICAN TO RECOGNIZE PALESTINE: The Vatican has brokered at “treaty” with the “State of Palestine.” The treaty reportedly deals with the activities of the Catholic Church in Palestine. Palestinian Authority Chairman Mahmoud Abbas is expected meet with Pope Francis over the weekend to finalize details. It hasn’t been very long since the Palestinian Authority/PLO was widely considered to be a terrorist organization. At a minimum, it seems Pope Francis is becoming very cozy with liberation theology, which is essentially a progressive/Marxist vision of Catholicism. 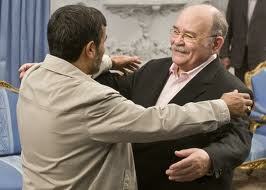 A top Soviet bloc defector recently claimed that liberation theology was created by the KGB. This should concern all Catholics.